Reiki Attunement Level 1 or ‘Reiki First Degree’ is the very first stage in the Reiki practitioner process and is open to anyone from complete beginners, to existing therapists, from all religions and backgrounds. No prerequisites are required, just an open heart and mind. Safe for everyone. Are you ready to take this first step in activating your healing touch? Learning Reiki opens the mind & spirit and empowers us to take responsibility for own life, health, and self-healing. Reiki meaning ‘Universal Life Force’ is a Japanese energy system that anyone can learn. It is performed by the ‘laying-on of hands’ whilst the client remains fully clothed on a massage couch or seated in a chair. The Reiki practitioner channels this spiritually guided life energy through their hands to the recipient for the purposes of healing the body, mind & spirit. Reiki and can be helpful for virtually all illnesses as it is said to accelerate the body’s natural ability to heal. This 1-day first-degree training introduces you to the Reiki healing system, during which you will receive the level 1 attunement, (by Reiki master Zari). This initiates you into the healing system, by opening your energy channels to connect to the universal life force energy for the purpose of healing the body, heart, and soul. Once activated you will be shown how to harness and work with the Reiki energy on yourself and give a healing treatment to friends and family. During this course, you will receive 2 traditional Level 1 attunements to activate the flow of Reiki healing energy from Reiki Master Zari G Ferns. 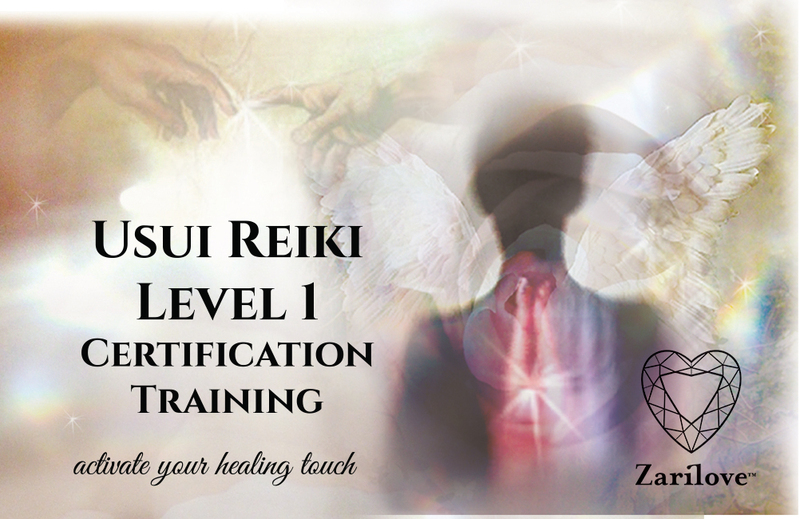 Zari was initiated into the Usui Reiki system in 2001 and to the Reiki Master level in 2003. She has a short Reiki lineage (reiki that has been passed down) Zari also works in crystal and spiritual/channel healing, and a range of holistic therapies including Past life healing, trauma therapy, EFT, Hypnotherapy, breathwork, and bodywork. During this training day we will cover. The History Of Reiki: and the benefits of Reiki. Learn about the aura of your energy system. The qualities of Reiki and about the attunements. Introduction to ethical practice when using healing. Principles and precepts of Reiki. How to benefit from daily energy exercises, meditation, and self-healing treatments. HOW WILL I BE TAUGHT AND WHAT WILL BE HAPPENING CLASS? Reiki level 1 is purely for personal growth and use. After Reiki level 1 training you will be able to share this energy and practice on family and friends, during this time you will take part in a 21-day cleansing and self-healing process. This strengthens the healing channel and prepares you for the practitioner’s level 2 if you wish to take the training further. A lunch break of approx. 3/4 -1 hour. Please bring your own lunch, alternatively ASDA, Costa coffee is a couple of minutes walk. light refreshments will be provided. Course materials are provided, please bring a pen, wear comfortable, clothing a cushion and a blanket. Maximum 8 people for quality tuition. ** It is recommended to avoid nicotine and caffeine the day prior to and the day of class. Wear comfortable clothing made of natural fibers (cotton, wool, silk, etc.) Do not wear nylon stockings or any other restrictive type of garments. Bring a pillow and blanket. This is a full day class, remember to eat breakfast. Zari will off a 2-hour Reiki share on Saturday 13th 1-3pm for people who have completed Reiki level 1 to come and practice giving and receiving healing and offer guidance on any arising questions you may have about the process. You can register through Eventbrite for the event or contact us here directly.